I find it undeniable that ignorance is everywhere. I’d argue that someone who doesn’t see giant holes of ignorance inside of them is almost certainly just ignorant of one very big fact — that of the rest of their ignorance. Never attribute to malice that which is adequately explained by ignorance. 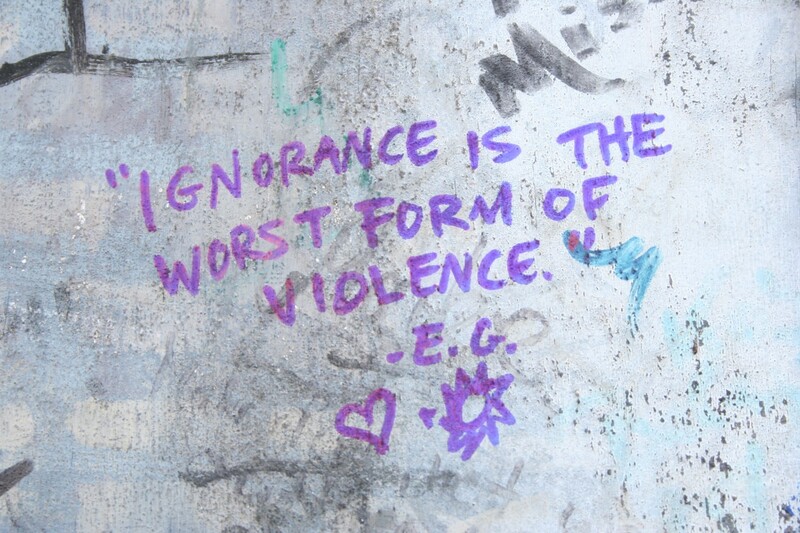 Admittedly, ignorance isn’t quite as nice sounding a word, but it’s a more accurate and useful idea there. I don’t think it’s useful to dispute that there are examples of active and knowing malice in the world. But I think those are dwarfed, if not rendered totally insignificant, by the apparent malice that results from ignorance. To my memory, there three varieties of situations in which I’ve caused harm without even realizing what my actions were. Complete ignorance of reality: I can recall times when I’ve experienced “rage”, or an “anger blackout”, and I know I’m hardly the only person to ever have the experience. For those who’ve been blessed with a milder temper, the experience I’m taking about start with snapping into a reality you didn’t intentionally choose. In that reality you’re doing or have done something that you’d never rationally have decided to do. For me, this was typically just shouting at someone, or saying a frighteningly mean thing. But for some people it ranges as far as physical violence or murder. In all cases I think its fundamental cause is ignorance of reality. Ignorance of others’ realities: There are times when I’m in control of my actions — fully aware of what I’m doing when I’m doing it — but unaware of the impacts of my actions on those around me. When I’m hurried, or unthinking, or distracted, I can say things which aren’t intended harshly but whose impact is quite severe. These situations are caused by ignorance of others’ realities. Ignorance of the future: Finally, many regrettable actions come out of ignorance of the specific impact of present actions on the future. It may seem fine to cut a corner right now, because I really need to get the project done. But when that corner-cutting turns out to have disastrous or even just bad consequences in the future, the cause could be said to be ignorance of the future. Almost every thing which seems malicious and bad in the world is a result of one of these three types of ignorance: personal, external, or future. If I truly and fully comprehend all the details of reality as it exists inside of my body, in the environment around me, inside the bodies of those in that surrounding environment, and in the future, nothing bad will ever happen in my life. If it were that way for everyone, we’d live in a just, harmonious, and kind world. We can’t really do that, but we can learn. We can pay attention. And we can consider the impact of our actions as we do them. Those are the paths to peace in the world, in your personal life, and in yourself. It’s not complicated, but it’s exceptionally difficult. Ignorance is our unchosen companion. Our brains are feeble and distractible, but understanding and learning ever more about reality is key to making the world a better place.